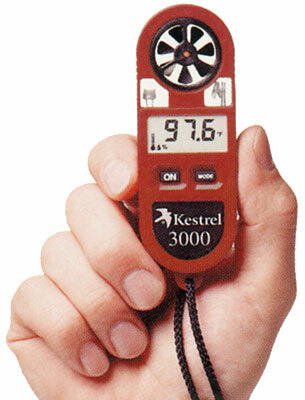 The Kestral 3000 Pocket Weather Meter is the ONLY hand-held instrument for measuring wind speed, temperature, wind chill, relative humidity, head index and dew point temperature. Pocket-sized and easy to use, the Kestral allows you to take fast, accurate reading of the environment conditions whenever and wherever you are. The Kestral 3000 Pocket Weather Meter is being used locally for agricultural spray Quality Assurance purposes as well as by rural fire fighter teams out in the field. Wind speed readings in knots, meters per second, miles per hour, feet per minute, Beaufort force. External temperature and humidity sensors for fast and accurate response. Includes slip-on hard cover, adjustable lanyard, and battery. Operating Modes: Moving 3-second average, maximum 3-second gust and average wind speed. Scales: Knots, meters per second, kilometers per hour, miles per hour, feet per minute, and Beaufort. Operating Modes: Temperature; wind chill, relative humidity, heat index, dew point. Dimensions: 122 x 42 x 14mm, weight 43 gm. Kestrel is a trademark of the Nielsen-Kellerman Co.